Vegetable of the Week is … Sweet Corn! Eat it now! No handling is necessary if you eat raw corn on the cob—yes, it’s delicious—or plan to cook it in the husks. 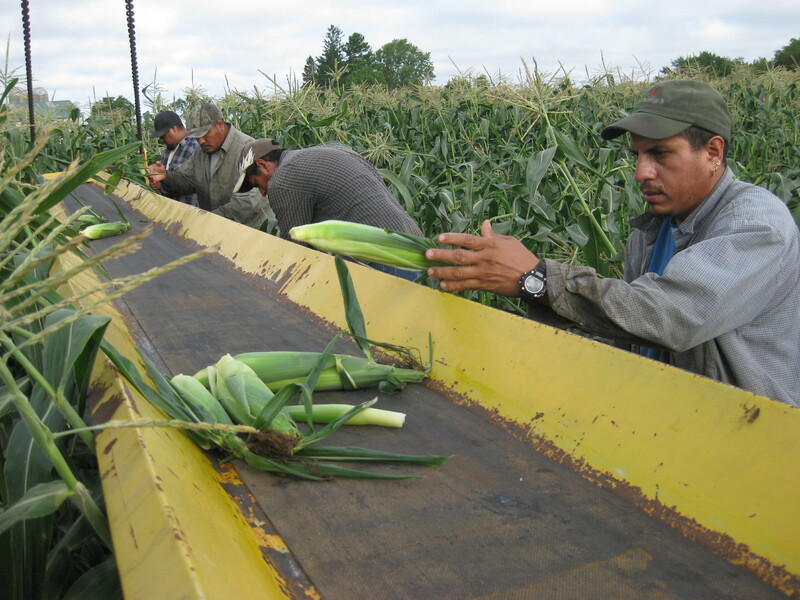 At Angelic Organics we aim to pick our sweet corn at its very height of sweetness, before the sugars convert to starch. But if you must put off eating corn, leave the husks on and refrigerate the ears in a plastic bag for as little time as possible. After about 4 days the corn’s sweetness begins to diminish. This recipe, from Taste of Home and found using Google’s Recipe Search, pairs corn with the dill in your box this week. ~5 medium ears sweet corn in husks ~1/3 cup butter, softened ~1 tablespoon prepared horseradish ~1/2 teaspoon salt ~1/4 teaspoon garlic powder ~1/4 teaspoon white pepper ~1/4 teaspoon snipped fresh dill ~10 fresh dill sprigs. Soak the corn in cold water for 1 hour. Meanwhile, in a small bowl, combine the butter, horseradish, salt, garlic powder, pepper and snipped dill; set aside. Carefully peel back husks from corn to within 1 in. of bottom; remove silk. Spread butter mixture over corn; place two sprigs of dill on opposite sides of each ear. Rewrap husks and secure with kitchen string. Using long-handled tongs, moisten a paper towel with cooking oil and lightly coat the grill rack. Grill corn, covered, over medium heat for 25-30 minutes or until tender, turning occasionally. Cut string and peel back husks. Remove and discard dill sprigs before serving. Yield: 5 servings. We grow several herbs at Angelic Organics: anise hyssop, basil, cilantro, dill, lemon balm, oregano, parsley, sage, summer savory, tarragon, and thyme. They are a lot of work for filling up just a little space in your box. However, we think they are important to offer to our shareholders, because sometimes the sun doesn’t take things quite far enough. See The Pig Completes the Bunny on page 348 of your farm cookbook for further development of this idea. I’m reflecting more on the cookbook these days, as I thumb through it for stories and articles to highlight for our shareholders. The publisher recently offered to do a revised edition, due to escalating numbers of CSA shareholders throughout the country. Problem was, the publisher wanted to delete the color photos to bring the retail price down. I said no. I maintain that the photos are an important context for the presentation of the vegetables. You have probably noticed that there are no photos of recipe dishes in the cookbook, but there are numerous photos of the vegetables growing in the fields, and of our workers tending the vegetables. You have ample first hand experience of these treasures once they arrive in your kitchen. We also want you to experience these vegetables on their journey before they arrive in your kitchen, to bring your awareness to these gifts of their whole passage through life, not just their final destination. After reading An Omnivore’s Dilemna, I said to Michael Pollan: “I agree with everything you say about conventional corn. Problem is, I can’t behold a nice field of any kind of corn without admiring it, even when I know how messed up it is that it exists. It’s a primal sensation for me, the beauty of a field of corn.” Charitably, Michael said, “I fully understand, John. There’s nothing wrong with admiring a field of corn.” Maybe this pleasure from seeing a field of corn comes from being born in mid-August. When my parents were bringing me home from the hospital, they probably held me up to see the fields of tasseling corn between Beloit and our farm. I imprinted the impression like a baby duck imprints its mom. Our sweet corn fields, however, are not conventionally grown. What a sight they are! And now the corn is a sight in your box. Please let your friends know about our bountiful year. They can even see our crops in their full splendor and our most recent pack. Maybe they’ll reward you with a dinner from our box. Deadline for signups is Aug 1st. You can sign up on our website. Manager: This box of vegetables has a different energy about it than the last box we packed. Other Manager: That’s sort of cosmic what you’re saying. Manager: I think I’m actually sort of cosmic. I know I try to sound all scientific about things, but I think I actually have a cosmic side. August 13: Come to the farm to learn basics of caring for small herds or flocks of your favorite livestock. Register for both of these classes by Sunday, August 7. August Calendar. Yay sweet corn! I am hoping for an eggplant too! and there will be more sweet corn in the weeks to come!!!! !